Married love and musical intimacy, each informing the other, were in the air, in the notes, and all over the piano keys Saturday night in Rockport at the Shalin Liu Music Center. Eminent local pianist and teacher Russell Sherman and his wife, formerly eminent (in Korea) pianist and currently eminent teacher Wha-Kyung Byun, took the stage to celebrate, with four-hand communication, almost four decades of marriage. On that wedding day in 1974, composer and Harvard professor Earl Kim presented the keyboard couple with Josef Venantius von Wöss’s 1909 piano transcription of Mahler’s Symphony No. 4 (1900). This symphony, shorter than its mighty peers, largely unfraught, full of tunes, conveys its mostly demure and congenial effects quite commendably in this two-pianist reduction. To my ear it now seemed more to hearken forward to Stravinsky’s voicings, disorders, and missing/halting/extra beats (the orchestral original looks back toward Haydn), and I noticed everywhere more thematic polyphony, not that Mahler’s discontinuities and surprise turns made new sense. From the famous sleighbell start, the duo’s playing on two instruments was magical, Byun deliberate (the first movement’s marking) and anchoring, Sherman lilting and conducting, every subsection offering moments of rapt concentration both felt and heard, and a minimum of unsynched rhythm. Death’s fiddling in the “easy motion” Scherzo didn’t much succeed on pianos, but no matter. The third movement, a “serene” Adagio processional with variations and a couple of grieving moments, performs miracles of compositional variety—Mahler felt it to be his best of the type, which certainly is saying a lot—leading us triumphantly to the Paradise of the motive-summarizing fourth movement (“very leisurely”). It’s not simple to convey how deeply lovely these passages were, moving and tender too, as played by this couple with such great beauty and openheartedness. The finale, which started life as a song composed before the other movements, meaning they had to be made to work toward it thematically, is centered on modest poetry text from a century earlier, “Life in Paradise” from the collection “The Boy’s Cornucopia” (as Wikipedia insightfully translates “Des Knaben Wunderhorn”). Michael Steinberg liked to point out that we know it’s a boy’s joyful celebration because it has a lot to do with food, here saint-delivered. (New version of the old joke: the food is free and practically comes right to you; yeah, and such large portions!) 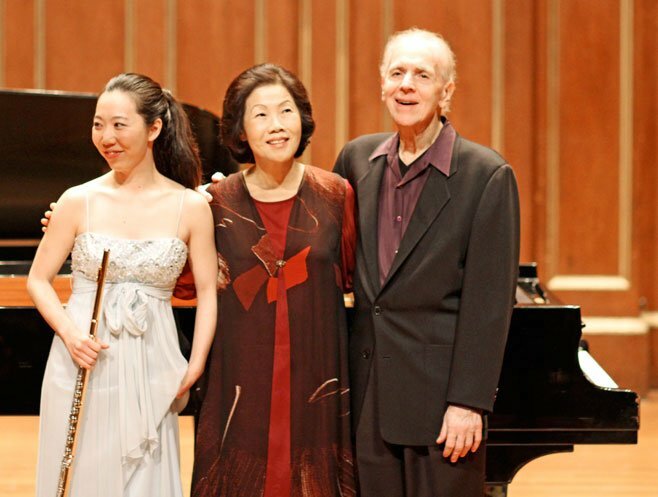 The Sherman-Byun performance continued with the most touching loveliness, and flutist Sooyun Kim played the vocal part ravishingly, walking and inflecting her expression just like a singer. It all made for a genuinely affecting concerted experience. Little of this showed itself in the Mahler, and only a little in Schubert’s Divertissement a la Hongroise (Amusement in the Hungarian style, D.818; 1824), which began the evening. By divertissement, of course, Schubert can mean not just diversions but strangeness at length, mood-shifting, not so unlike Mahler, actually. Sherman, also a writer of discernment, aptly notes that “charm, dash, melancholy, mustaches and monocles, wine…” all flourish in the piece. Years earlier, Schubert got a summer gig teaching daughters at one of the Esterhazy country houses, and went back a few years later, but now a year after his diagnosis of serious illness; he wrote this piece right upon return to Vienna. It starts dejected, turns strangely cheery, gets fetching, and proceeds in multipolar style from there. Several subsections invite dancing and/or marching, but Schubert doesn’t much mean it in the usual senses: these are dances and marches with, well, maybe not death, but with partners and troops who seem chiefly grim. While again gracefully and sensitively “listened into” by the pianists with considerate teamwork at one keyboard, their D.818 performance didn’t cohere for me, and it wasn’t merely the piece’s weirdness. The playing was, to generalize, uncohering sometimes just from the split attacks, with Sherman almost always milliseconds to the side of Byun’s beat—for effect. The effect, a mini-rubato, did keep the various surprises feeling extra-mischievous, idiotic, skipping, somber, oomphy. All the Youtube versions of this work are fully coherent, probably overmuch, pointed out my own musical wife, meaning the piece feels less surprising. (Father-son Schnabel take it fast, and it’s some wholly other, unbrooding yet mustache-free work.) In any case, Wha-Kyung Byun breathed her own steadiness into it throughout, playing off the split beats perfectly. Now that’s marriage. For an encore—none was needed after the closing quietude of the Mahler, its simulated harp in the bass keys simulating its opening jingle, but hey, the couple could not have refused—Sherman and Byun struck up Gershwin’s “Embraceable You” (neither the Grainger nor the Wild piano version, I believe). They swung into it, in easy, happy, loving synch, and when it ended, teacher in his 80s even did a cool little two-step shuffle toward student now wife in her 60s. The encore’s supple swing showed that tipsy gypsy Mr and irreplaceable Mrs, should they ever need to give up their day jobs, can get gigs at the Regattabar anytime they want. Did they have an extra piano tuned a tone higher ? Piano scordatura is an interesting concept, but I doubt there will ever be much call for it. For one thing, the piano tuners’ union would probably refuse to cooperate. Ha, very good. I am sure Kim had some clever effects to that end going on in that movement, but I couldn’t tell you what they were, exactly. I would like to relisten to the concert. The Rockport Music printed notes explicitly say, and the Sherman/Byun program note sort of implies, that the Mahler 4 arrangement was by the late composer Earl Kim. It was not, and the review text above now gives the correct credit.